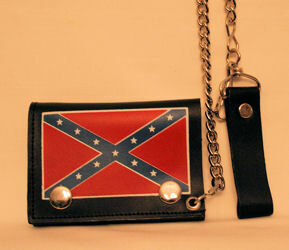 Item Name: Rustic Style Leather Rebel Flag Tri fold Chain Wallet with chain. 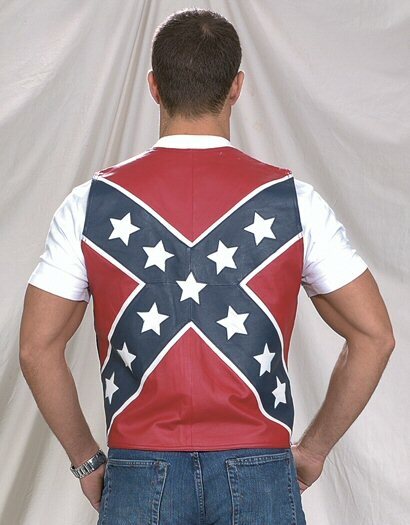 Dixie leather works if you want to attract attention by wearing unique clothing and accessories. 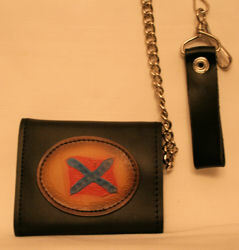 Our leather is great for riding your Harley or any occasion. 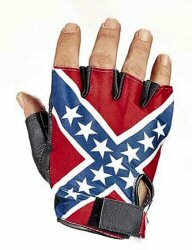 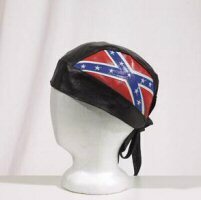 For a redneck Christmas gift for your special person with a rebel attitude give them a leather Confederate Cap, Southern fingerless leather gloves, Rebel Flag leather wallet for a man, part of our Southern leather gallery features a leather jacket with a Confederate Flag on the back, a leather vest with a Confederate Flag on the back, a leather vest with the Texas Flag on the back, a leather skull cap with a Confederate Flag on the sides, vest extender with Confederate Flag trim. 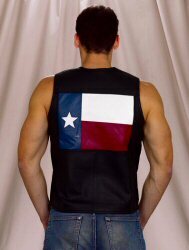 This Southern style merchandise is hot, macho and just plain out there!